there are so many things i am thankful for: my fabulous family (including all the ones that i acquired when i married mike), a house that i'm so happy to come home to, a job where i work with some of the nicest people i know, and the chance to spend a holiday eating delicious food with some of that wonderful family, are just a few of the leaves on my "thankfulness tree." thanks to missy for the gift of the tree. 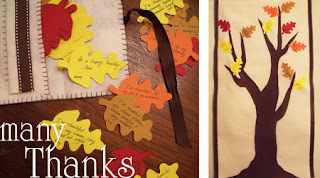 i hope to make it a tradition to fill it up with leaves each year. what a great reminder to think about all the blessings i/we have received. tomorrow we're off to columbus to visit mike's family, and extending this first thanksgiving for the boy (the biggest blessing of all). incidentally, i was hoping to get everyone on my christmas list this boy-in-a-box. it's the coolest thing ever. but unfortunately, i haven't found another one quite like this one, and i'm just not ready to part with mine. 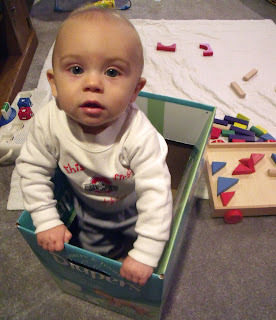 ps - sammy is thankful for puffs and pie and a box to play in.